When using the Eraser tool on a vector layer, you can use either solid vector erasers or textured vector erasers. By default, your eraser will be a solid vector eraser. A solid vector eraser cuts out the shape of its stroke from your vector artwork. 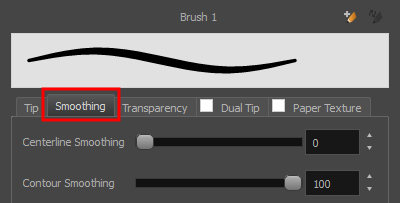 A solid vector brush's tip can be shaped like a circle, a diamond or a square, and can be configured to have a specific size, aspect ratio and angle. Also, solid vector brushes can be automatically smoothed by Storyboard Pro as you draw. If you are erasing on a bitmap layer, you can only use textured erasers. In the Eraser Type dropdown list, select Solid Vector. NOTE When drawing with a mouse, your eraser is always at its maximum size. When drawing with a pressure-sensitive pen tablet, your eraser's size will range between its minimum and maximum size, depending on the amount of pressure you put on the pen when drawing. Use the Centerline Smoothing slider to set the amount of smoothing Storyboard Pro should perform on your stroke's direction, curves and corners. A higher setting will prevent your line from being shaky, but is liable to reduce your drawing precision and to round sharp corners into curves. Use the Contour Smoothing slider to set the amount of smoothing Storyboard Pro should perform on your stroke's contour. A higher setting will round sharp corners and reduce the amount of control points for the resulting vector shape. NOTE To learn more about the Eraser tool options, see Eraser Tool Properties.